I have passed The Harbour Coffee Shop countless times on my trips to Commerical Road, but I am shocked that it was only this week I paid it a visit. The cafe, which was once the Music Room, is easily drowned out by fast food shops such as Subway, Burger King and McDonald’s. This is not because the cafe can’t compete, far from it, but when you’re rushing around town, a Big Mac seems a quick alternative to a tasty lunch. Or, if you’re like me and are stubborn when it comes to change. But, on Shrove Tuesday this year, I threw myself to the winds of change and was blown away by The Harbour Coffee Shop. 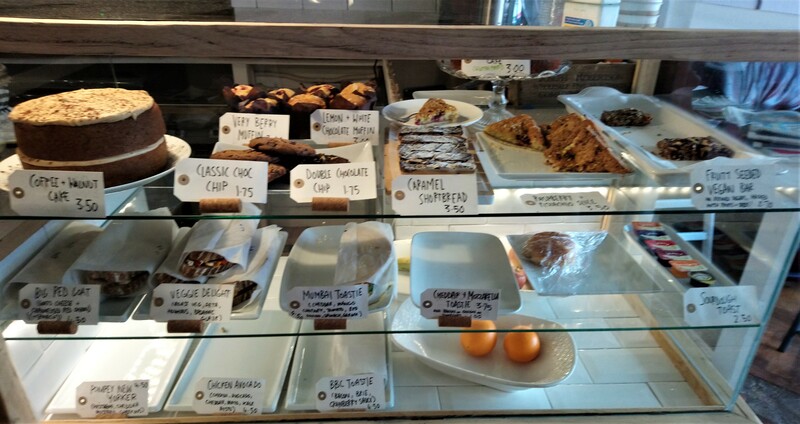 Part of the Harbour Church, this coffee shop is a quaint little place with large overhanging lights, rustic, wooden tables and a cabinet boasting plenty of tasty treats. As I entered, I noticed it was far bigger inside than I thought with a light, airy space and plenty of tables. On the right-hand side before the till, were plenty of cakes, cookies and croques. There was a huge coffee and walnut cake, caramel shortbreads, fruit seeded vegan bars and toasties including the ‘veggie delight’ and ‘chicken and avocado’. These were wrapped in paper and looked neat and pristine, tempting meat-eaters, vegetarians and vegans alike. I crouched down and oggled each one, licking my lips and reading the ingredients to the finest detail. The ‘veggie delight’ had feta, hummus and peppers and the chicken and avocado had, well, I’m sure you can work that one out. There were other toasties with caramelised onion, bacon and brie. The combinations were unique and upon seeing me, the server came over, explained them and said he could make something else up – providing they had the fillings. I asked if they could make the Pompey New Yorker, which had sold out, which included pastrami, cheddar and gherkins. Sadly they couldn’t as they didn’t have all the ingredients but it was nice they tried anyway. In the end, I ordered a ‘Big Red Goat’ which had caramelised onion, goats cheese and spinach, and a caramel shortbread, obviously. The waiter, very kind and just as scrummy looking as the food, took my order and asked me what I would like to drink, directing me to the chalkboards above his head. 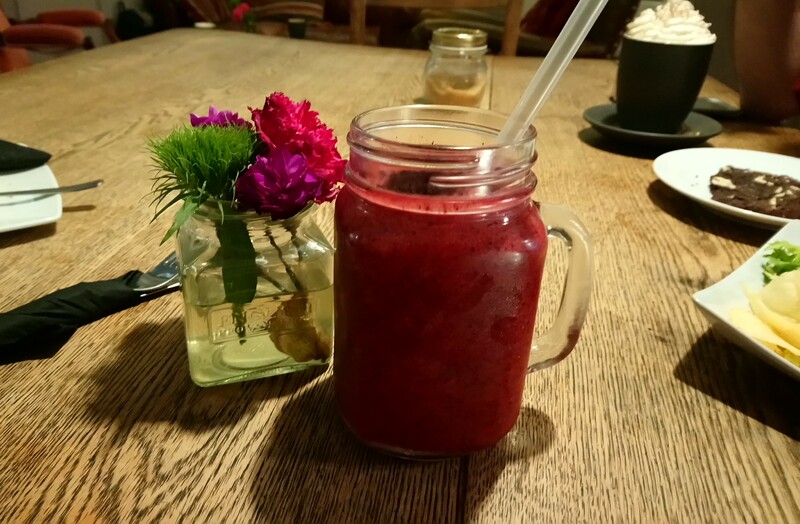 They had plenty of hot drinks, including coffees and hot chocolates, and some tempting smoothies which had ingredients such as acai powder, blueberries and blackberries. I was torn between one of these and a tea. What did I do? Ordered both. So I did. I ordered a toastie, caramel shortbread, tea, smoothie AND lemon and sugar pancakes. It was Shrove Tuesday after all and Cyndi Lauper was right, girls do just wanna’ have fun. All of this cost just over £15 which I thought was great value for money. It was just the thing I needed to brighten up my grizzly Tuesday as the rain continued to pour down outside. In the background, as I waited for my drinks and food, soft piano music played and I could feel my whole body relax. It was warm and atmospheric in The Harbour Coffee Shop and within seconds of sitting down, I knew it was the best place for me in Commercial Road. Sorry (not sorry) McDonald’s, I thought, as my food was placed before me. The caramel shortbread was first up. 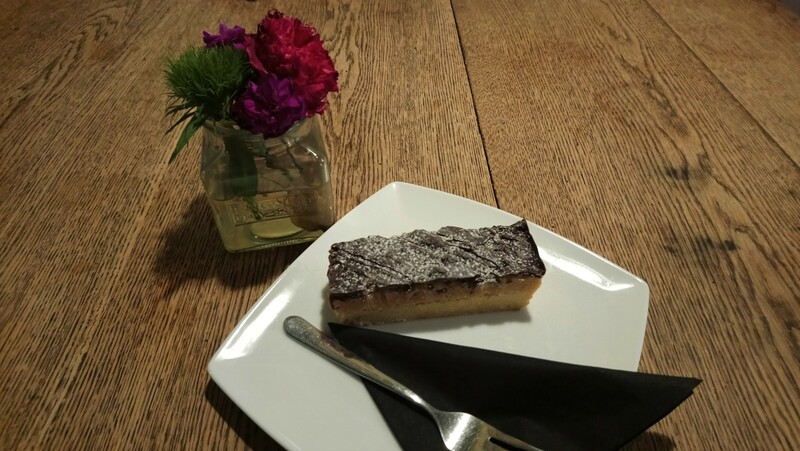 Although the chocolate on top was hard, the shortbread base was crumbly, rich and buttery. It fell apart in my mouth. The caramel was gooey and sweet and the dark chocolate top complemented it all perfectly. Tick. So far so good. 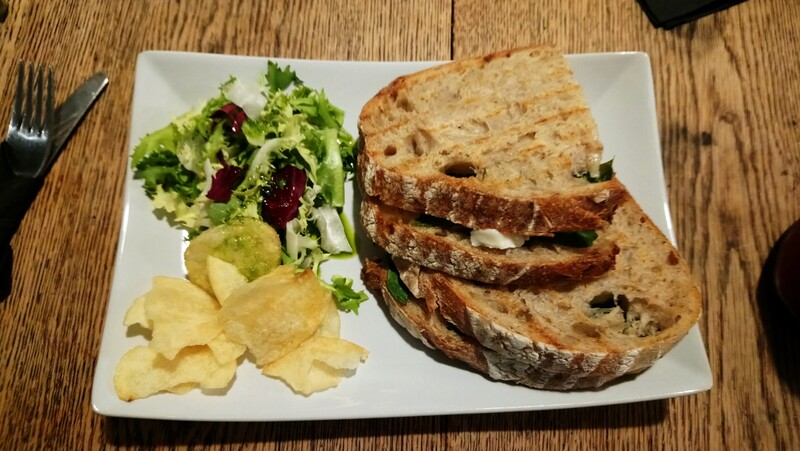 The toastie was presented to me neatly and beautifully, on a white rectangular plate, with a side salad and crisps. 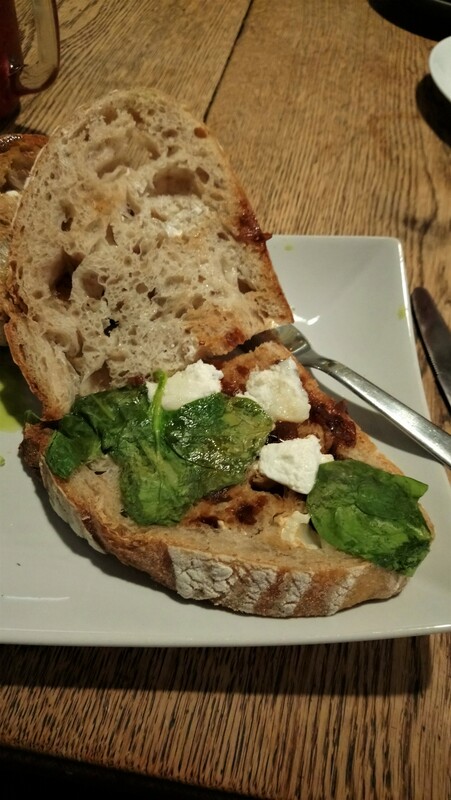 The sourdough was soft and not toasted too much, and inside boasted plenty of spinach leaves and caramelised onion. Sadly there wasn’t much goats cheese to show off. There were only a few, small lumps in the sandwich and as I took mouthfuls, I could only really taste onion and spinach. It was nice and all worked well together but I couldn’t finish it. There were only so many mouthfuls of caramelised onion and bread you can stand before you get fed up. If it had more goats cheese, say a thin layer throughout, Harbour Coffee Shop would have earned another tick. Next was the smoothie. It came in a mason jug with a handle and was deep purple in colour. I took a sip. Then another. And another. I couldn’t stop. It was gorgeous! It was both tangy and sweet as I could taste the blueberries, blackberries and cranberry juice and within seconds I finished it all off. Unlike most smoothies, it was thin and refreshing and is more than enough reason for me to return. I am still craving one now. At this point, my stomach was full but the pancakes arrived. My body said no but my brain said yes, yes yes. I stared down at the two thin pancakes, rolled up neatly, and, as suggested by Nike and Shia LaBeouf, I did it. I ate them. On the side of the pancakes, I was given an espresso cup filled with sugar. I sprinkled plenty over my dessert but there was still plenty of sugar left. 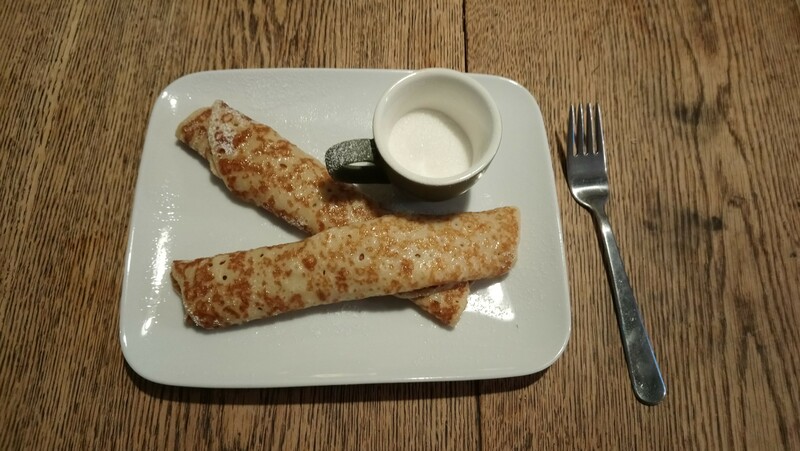 A bit overkill, I thought, as I placed the shot of sugar to one side and shoved the pancakes into my mouth. They were springy and moreish but I would have prefered more lemon juice to give a bit of kick. Defeated, I leaned against the back of my chair and sat there groaning for the next ten minutes, Before I left, I made sure to thank the kind staff and grab a loyalty card. I was going back and I was going to get that card filled up. 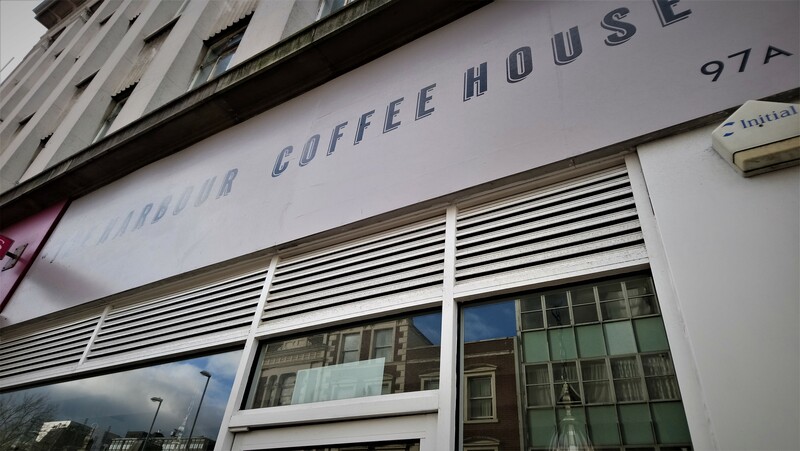 The Harbour Coffee Shop is a gem in Commercial Road and one that glimmers bright no less. It outshines the countless nearby fast-food joints and is certainly worth your time. Pay it a visit and see for yourself. I promise you, it is better than a Big Mac or a foot-long, whatever your poison.